Let me be honest, I have always been having trouble getting my spending under control. I tend to over spend month after month and that is slowly but surely chipping away at my savings. Last month I have decided to embark on a strict spending diet. This amount I divide it by 12 so that I know how much I need to put aside to make these payments when the time comes. This way I know I won't be scrambling when a huge bill comes. - Money that I am setting aside for fixed yearly expenses. Don't forget to add categories for any specific expenses that are coming up for that month. I added a Kickstarter category because I know a project I have backed is due to be funded next month. Any money that is not neatly assigned to a category will be placed in the miscellanous category, that is effectively your slush fund. Then once that is nailed down. I enter my budget for the various categories into Back in Black on my iPhone to keep track of my expenses. The amount that you assigned for each category is not exactly set in stone you can adjust them as the month goes. The idea is to not ever needing to withdraw money from your savings. In addition to the planning that I have done above, I also maintain a few bank accounts. I would have one for savings - this account is only meant for input and never output. This is the rainy day fund. I would also have one for my daily spending. Then I have the 3rd account where I transfer money into for every credit card purchase I make. That way I would not mistake the "excess" money in my spending account as extra money. It is money that is already spend but not taken away from you just yet. If you have any debts, it would be good if you can seperate these into their individual accounts if at all possible. Check out Standard Chartered Bank's e$saver account if you are interested. With no minimum sum to maintain and no debit card issued to you, it makes it perfect for my purposes. As much as I can I would plan my budget for the next month as soon as I can, that way I can view ahead and decide if I need to save more for any particular month. One example, my pre-order game is due to be pay up in November so I can set money aside for it in November or earlier if I can. Regardless, with the help of my plan, this month has been within my budget so far. I will check in again and let you know how my plan went. UPDATE: I have successfully kept within my allocated spending budget for 2 months running. Here's to continued success in financial control. Last week I sent my Macbook Pro in for repairs. The bluetooth connection between my MBP and my Mighty mouse has been weird at best. The connection drops intermittently but the system preferences will still show at the Mighty Mouse is still connected though nothing happens when you wiggle the mouse. Nothing corrects this problem other than a restart. This can be a real pain especially if you are researching and writing a blog post. There is no way you want such an interruption if you are on a roll. Regardless, this isn't the point of the post. This post is to describe my life with my iPad mini. A basic rundown of what I usually do with my MBP from day to day. I watch drama serials, write blog posts, surf the internet. I skim through Facebook, check Twitter and listen to podcasts and Spotify. I would say I consume media more than I create them on my MBP. However, all in all, using my iPad Mini exclusively for an entire week wasn't as bad as I had expected. It wasn't the tough and hard wait for my beloved MBP to return to my hands again. Though I am actually typing this out on my MBP, I wouldn't mind going all iPad Mini only. Nevertheless, let's just hope that my MBP doesn't need another trip to the doctor again. I have been looking for a pair of good headphone to replace my Sennheiser HD429. I dug through pages after pages of forum posts and had hands on time with a number of shortlisted headphones at Stereo. I have finally settled on the Bose AE2. Aethetically, the AE2 is very nice and simple. I got myself the white version. The black version is nice but it looks just like any other pair of headphones. The white ones goes nicely with my MacBook Pro and they really stand out. The leather-like cushions that nestle over your ears are by the far the most comfortable ones I have ever experienced. The comfort level of these cushions are on par to the Skullcandy Aviator. There is a small pad of cushion at the top of the head band. It is made of fabric like material, probably to help absorb prespiration. Also, the AE2 is light. It isn’t heavy like some Shure headphones that weigh your head down when you put them on. The way the AE2 clamps around your head isn’t too tight. You won’t be getting a headache from heavy usage. I like the Bose AE2 because they fulfil one very important thing for me. The cable comes out of just one side of the headphones, the left in the case of the AE2. The cable is wrapped with a material that made it slightly stiffer than usual. That way the cable isn’t as prone to tangles. The AE2 is very portable. It comes with a small pouch. The headphones swivel to be able to lay flat. Once it is flat it doesn’t take up too much space. And being light, the headphones doesn’t add too much weight to your backpack or handbag. Personally, I can’t comment too much about the sound quality as I am not an audiophile. All I can say is this pair of headphones isn’t very bass heavy. I don’t like too much bass so if I enjoy it, the AE2 probably doesn’t have much bass. It is perfect for my type of rock and pop music. I got my pair of Bose AE2 from The Headphone Shop in Seoul Korea. It costs me 170,000 KRW. The price in Singapore is SGD$219. The AE2 comes in another version known as the AEi. The AEi has a remote on the cable that allows you to change the tracks and adjust the volume as well as use the headphones as a hands free set and it is comptiable with the iPhone. That feature is going to cost you SGD$269. In my humble opinion, it is probably not worth the price premium. If you are looking for a comfortable pair of headphones, you can’t go wrong with the Bose AE2. I have been trying to keep track of how my homescreen changes for a while now. Though this is the first that I have uploaded to my blog. Phone - More often to check on my missed calls then to actually call anyone. More often then not, swipe over to spotlight to look for the right contact to call. Messages - Also to check on any incoming smses than to send them. In Singapore, What's app is the popular choice. Fantastical - To quickly add events into my calendar. I also have Fantastical on the Mac. Downcast - For all my podcast listening needs. [Taskpaper](http://www.hogbaysoftware.com/products/taskpapp my lists. Lists of things to buy, bills to pay, things to do. I also have Taskpaper for the Mac. Byword - I use Byword to access the notes on my Dropbox. One issue I have is that it doesn't keep a copy of the notes on the phone. So I can't use Byword to access my notes with there is no 4G or wifi. Chrome - For all my website browsing needs. I have a bookmarklet that sends my links from Safari to Chrome. Capture - Launch the app and it instantly starts recording. All the better to catch the little moments in life. Guitar Toolkit - Great for tuning my guitar and ukulele. Calcbot - A wonderful calculator from Tapbots. I just love the sounds. Twitterific - I have recently switched from Tweetbot to Twitterific. Right now, I dig the larger fonts and animated bird logo. Photos - To view all my photos and videos. Weather Lah - The app to check on Singapore weather. All other "international" weather apps that I have used doesn't come close. Settings - To easily switch on and off airplane mode. No, I don't take planes often but this is used as a troubleshooting measure. 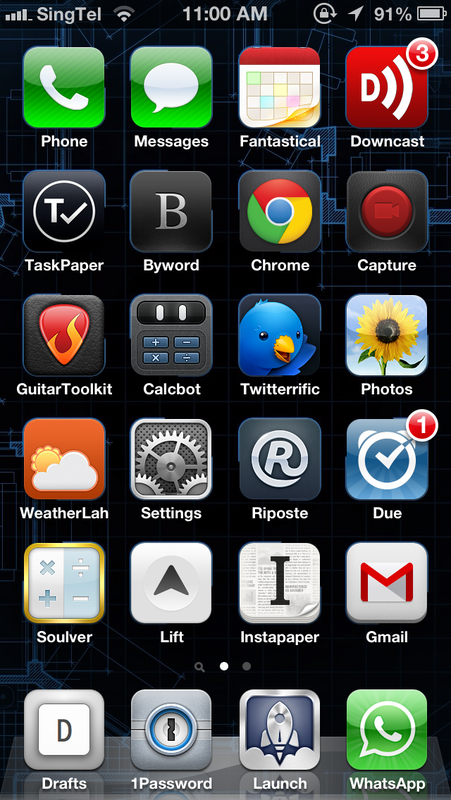 Riposte - My App.net client of choice. I wish it has a iPad version. Due - For all timed remainders and events that happen on a regular schedule. I also have the Mac app for this. Soulver - I use Soulver to keep track of my expenses. I have Soulver everywhere on my iPad and Mac. Lift - A habit tracking app that I have just started using. So far, the clean interface is really nice. Instapaper - My read it later app of choice. Though it is not maintained as often of late. I look forward to what Betaworks would do for Instapaper. Gmail - I have return to the standard Gmail app. Previously I was using Mailbox but I didn't like the way it messes with my folders. I am still on the hunt for a suitable replacement for Sparrow. Drafts - This is my Launch Centre Pro for all my writing apps. 1Password - The one repository of all my passwords. Launch Centre Pro - A shortcut to all my other frequently used for non essential apps. What's App - Singapore's messaging service of choice. Alternate Haven is the name of my blog. This blog is in what is probably it’s 5th incarnation. I started with a geocities site, hands up if you still remember that. That one I created when I just learnt Dreamweaver and I crafted it more or less using tables and photoshop. Then, I had a livejournal blog for a while which was quickly left to lauguish on it own. After that, I had a tumblr which had a focus on my photographs, I have since closed it after moving all my photos to 500px. Next was my Wordpress site and now the latest one at Squarespace. This is actually the first time I had paid for a service which hosts my website. The difference between paid and free is truly jarring. The templates on squarespace is very manipulable and everything is customisable. There is a wide range of fonts to choose from and importing my exisiting wordpress content over is a breeze. I went with the unlimited annual plan. It was 20% of the regular $20/mth price. Coupled that with a Back to Work coupon (Cash), I got another 10% off the total price. That roughly worked out to be about $222 SGD for me which is less than $20 a month. This is more than affordable with the amount of easy customisation Squarespace is offering. I even got a free .com domain for signing up for the annual plan. Though I have just made the move from Wordpress for last than a week, I am really liking Squarespace. Give Squarespace a try, they have a 14 day free trial. I had to edit my friend’s pre-wedding montage this year. As a challenge to myself, I took the chance to have the project edited in Final Cut Pro X. Final Cut Pro X debuted (last year?) to much cries of dumbing down and iMovie Pro. I wanted to find out for myself and at the same time add another “feather” to my cap. There was only one thing to do. I scrapped up SGD$370 and purchased Final Cut Pro X via the Mac App store. And the next step, go to the nearest library and check out Peachpit’s Final Cut Pro X by Diana Weynand. So I embarked on my journey to learn Final Cut Pro X.
I spent my evenings running through the book and learning the basics of FCPx by just clicking everything in sight. I have a confession to make, I didn’t finish reading the book. The software isn’t hard to figure out if you are familar with the original Final Cut Pro or Avid. I can’t speak for Premiere Pro since I never had a hands on before. Coupled together with the help of the internet, pretty much any editor should be able to make sense of the software. There are things made better in FCPx while others are harder than before. You can switch on waveforms for the audio track right on the timeline panel itself. No more going into the sequence settings panel. You can shift multiple video or audio within the edit and have the video and audio close the gap that your video or audio has left behind. No more ttt and shifting here and there. You can assign keywords and ratings to clips to make for easier searching. More work for a logger but it makes it easier to look for clips. You have audio and video scrubbing! The audio scrubbing might be a little too much at first when you use it. More text effects and video transitions! You can no longer view all the attributes timeline in one panel. These have been shifted to the timeline itself. This is a problem when you do not have enough screen real estate to open all the layers that you need. Also, the attributes timeline isn’t seperate into the individual attribute such as position or scale. You keep having to shfit between the inspector and the timeline. You can no longer have certain clips be on specifc tracks because there is no longer any tracks. For an example, you want to keep the sequence neat and easy to understand by keeping the subtitles on track 8. Or you want to seperate SOT, music, SFX and VO in their seperate tracks, you can no longer do this. The clip will fall to the lowest possible “track” unless another clip is occupying a higher “track”. You have to make a clip into a storyline just to add a transition to it. Why? I can see no advantages to this. The panels can no longer peel off so having a dual monitor setup would be less useful than having a single large screen. I have not used FCPx for long and I am far from comfortable with it. Currently my day to day editing software is Avid, though not by choice. If it were up to me, I would have probably stick to the original Final Cut Pro. Regardless of my choices, as a video editor, I must be adaptable and at least have a basic working knowledge on how each editing software works. If you are a video editor I would suggest borrowing a Mac with FCPx installed just to play around with it, just to get a feel of it. I’ll probably have to check out the Peachpit’s Final Cut Pro X by Diana Weynand again to read through the rest of the book.